Since the 1930s, tamanu oil has been thoroughly researched, and the conclusive evidence on its ability to heal damaged skin is overwhelming. Its benefits are notable for the treatment of scarring, stretch marks, minor cuts and abrasions, rashes, dermatological conditions and much more. This strong but gentle oil can be applied directly to the skin and lips and is commonly mixed within skincare formulations such as: anti-aging/anti-wrinkle/regenerative formulas, and sun-protection and after-sun care. Tamanu oil has unusual penetrating power as well as some unique components such as calophyllic acid—a potent anti-microbial, and calophyllolide—a potent anti-inflammatory. These, together with a rich array of lipids and fatty acids at 38% oleic (Omega 9) and 31% linoleic (Omega 6) make Tamanu an altogether superior skin oil that has the ability to soothe, smooth, nourish, heal, moisturize, protect, regenerate, de-wrinkle, plump and firm while adding a beautiful glow to the skin. more on Tamanu oil . . . The tangerine is a type of mandarin orange. The tree originated in China, and was brought to Europe in 1805, then to North America where much of the world's tangerine essential oil is produced. The essential oil is cold pressed from the peel of the fruit. This wonderfully sweet, fresh citrus top-note essential oil can be beneficial to the skin by reducing stretch marks and having a positive effect on cellulite, as well as for its nutritive properties – it is a good source of vitamin C, folate, beta-carotene, B1, B2 and B3. It is soothing, refreshing and uplifting. Emotional benefits include promoting happiness, peace and ease of: anxiety, depression, grief, nervousness and stress. It can also be used as an appetite suppressant. See mandarin. Tapioca (Portuguese pronunciation: [tɐpiˈɔkɐ]) is a starch extracted from Manioc (Manihot esculenta). This species is native to Northern Brazil but spread throughout the South American continent. The plant was carried by Portuguese and Spanish explorers to most of the West Indies, and continents of Africa and Asia, including the Philippines and Taiwan; it is cultivated worldwide. In Brazil, the plant (cassava) is named mandioca, while its starch is called tapioca. The name tapioca is derived from the word tipi'óka, its name in the Tupí language, which was spoken by the natives when the Portuguese first arrived in theNortheast of Brazil. This Tupí word refers to the process by which the cassava starch is made edible. As the food and word were taken to other areas, "tapioca" was also applied to similar preparations made with other esculents. In the Philippines, tapioca is often confused with sago, as the sap of the sago palm is often part of its preparation. A coarsely granular substance obtained by heating, and thus partly changing, the moistened starch obtained from the roots of the cassava. It is much used in puddings and as a thickening for soups. In India, the term "tapioca-root" is used to represent the root of the plant (cassava), rather than the starch. It is widely named as "കപ്പ" (kappa) in Malayalam. InVietnam, it is called bột năng. In the past, the starch was extracted from Maranta arundinacea (Mì tinh, hoàng tinh). In Indonesia, it is called singkong. In Malaysia, it is called Ubi Kayu. Tapioca is a staple food in some regions, and it is used worldwide as a thickening agent in various foods. It is a gluten-free food. Linalol is a softer, non-irritating variety of the thyme plant (from the terpene alcohol linalool content). The leaves and flowers are antioxidant, antifungal, antiseptic, aromatic, astringent, circulatory stimulant, cleansing, disinfectant, refreshing and stimulating. Active constituents of thyme include: terpenes such as thymol (named for the plant), phenols, labiate tannins and flavonoids. Thyme is so powerful that during World War I it was used to disinfect soldiers’ wounds. Recommended for blemished, combination and oil-rich skin, thyme is included in facial steams, masks, cleansers, toners, bath herbs, massage oils, soaps, deodorants and aftershaves. Healing for oozing acne and rashes from poison oak, ivy, sumac or general contact dermatitis, thyme also helps treat arthritis, eczema, insect bites, psoriasis, muscle aches, poor circulation, warts and wounds, and is highly recommended in the treatment of infectious skin diseases. It is used in antifungal preparations such as salves and washes to deter athlete's foot, ringworm, scabies, crabs and lice. It is also included in anti-dandruff products such as shampoos, conditioners and hair rinses and helps keep hair dark and silky. Used in mouthwashes for its antiseptic properties, it also prevents plaque formation. According to E.S. Rohde, this enchanted herb was a favorite of the fairies. This uplifting essential oil provides emotional benefits including ease of: fear and emotional and mental fatigue. (CI 77891): a naturally occurring oxide of titanium, generally used as a pigment. Cosmetics grades are extremely pure and highly prized as an effective nonchemical sunscreen. Approved for use in cosmetics in the U.S., E.U. and Japan. Be Yourself Beautiful does not approve of the inclusion of nano-sized titanium dioxide in cosmetic formulas. Titanium dioxide, also known as titanium(IV) oxide or titania, is the naturally occurring oxide of titanium, chemical formula TiO2. When used as a pigment, it is called titanium white, Pigment White 6 (PW6), or CI 77891. Generally it is sourced from ilmenite, rutile and anatase. It has a wide range of applications, from paint to sunscreen to food coloring. When used as a food coloring, it has E number E171. Titanium dioxide is the most widely used white pigment because of its brightness and very high refractive index, in which it is surpassed only by a few other materials. When deposited as a thin film, its refractive index and colour make it an excellent reflective optical coating of dielectric mirrors and some gemstones like "mystic fire topaz". TiO2 is also an effective opacifier in powder form, where it is employed as a pigment to provide whiteness and opacity to products such as paints, coatings, plastics, papers, inks, foods, medicines (i.e. pills and tablets) as well as most toothpastes. In paint, it is often referred to offhandedly as "the perfect white", "the whitest white", or other similar terms. Opacity is improved by optimal sizing of the titanium dioxide particles. Some grades of titanium based pigments as used in sparkly paints, plastics, finishes and pearlescent cosmetics are man-made pigments whose particles have two or more layers of various oxides – often titanium dioxide, iron oxide or alumina – in order to have glittering, iridescent and or pearlescent effects similar to crushed mica or guanine-based products. In addition to these effects a limited color change is possible in certain formulations depending on how and at which angle the finished product is illuminated and the thickness of the oxide layer in the pigment particle; one or more colors appear by reflection while the other tones appear due to interference of the transparent titanium dioxide layers. In some products, the layer of titanium dioxide is grown in conjunction with iron oxide by calcination of titanium salts (sulfates, chlorates) around 800 °C or other industrial deposition methods such as chemical vapor deposition on substrates such as mica platelets or even silicon dioxide crystal platelets of no more than 50 µm in diameter. The iridescent effect in these titanium oxide particles (which are only partly natural) is unlike the opaque effect obtained with usual ground titanium oxide pigment obtained by mining, in which case only a certain diameter of the particle is considered and the effect is due only to scattering. In cosmetic and skin care products, titanium dioxide is used as a pigment, sunscreen and a thickener. It is also used as a tattoo pigment and in styptic pencils. Titanium dioxide is produced in varying particle sizes, oil and water dispersible, and in certain grades for the cosmetic industry. Titanium dioxide is found in almost every sunscreen with a physical blocker because of its high refractive index, its strong UV light absorbing capabilities and its resistance to discoloration under ultraviolet light. This advantage enhances its stability and ability to protect the skin from ultraviolet light. Nano-scaled titanium dioxide particles are primarily used in sun screen lotion because they scatter visible light less than titanium dioxide pigments while still providing UV protection. Sunscreens designed for infants or people with sensitive skin are often based on titanium dioxide and/or zinc oxide, as these mineral UV blockers are believed to cause less skin irritation than other UV absorbing chemicals. Obtained by the vacuum distillation of edible vegetable oils, tocopherols act as a natural preservative (they help prevent rancidity and hence help to maintain the shelf-life of products that contain them) and important natural antioxidant. Considered an antioxidant superstar, vitamin E is a lipid-soluble vitamin that has eight different forms, of which some are known for being excellent antioxidants when applied topically to skin, particularly alpha tocopherol and the tocotrienols. However, other studies have indicated the acetate form (tocopherol acetate) is also bioavailable and protective for skin. And still other research points to tocopherol sorbate as providing significant antioxidant protection against ultraviolet radiation-induced oxidative damage. Antioxidants such as vitamin E act to protect cells against the effects of free radicals, which are potentially damaging by-products of the body's metabolism. Vitamin C and other anti-oxidants recycle vitamin E end-products back into effective suppressors of free radicals. Pointing to the significance of vitamin E for skin is an article in the Journal of Molecular Medicine (January 1995, pages 7-17) which states: “More than other tissues, the skin is exposed to numerous environmental chemical and physical agents such as ultraviolet light causing oxidative stress (free-radical damage). In the skin this results in several short- and long-term adverse effects such as erythema (redness), edema (swelling), skin thickening, wrinkling, and an increased incidence of skin cancer”. Vitamin E is the major “antioxidant protecting the skin from the adverse effects of oxidative stress including photoaging (sun damage).” Tocopherols also provide fabulous relief for chapped lips and ragged cuticles and are reported to soften and gradually fade scar tissue because they aid in tissue repair and moisturize the skin from within. Additionally, tocopherols protect fat in the body’s tissues from abnormal breakdown, increase micro-circulation, and may protect blood vessels. 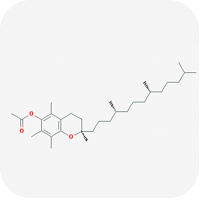 Little information is available regarding Trioctyldodecyl Citrate, which is used as an emollient and skin conditioning agent in cosmetics and personal care products. It is created by combining octyldodecanol, a fatty acid that helps to form emulsions and prevents formulas from separating into its oil and liquid components, and citric acid. The Cosmetics Database rates Trioctyldodecyl Citrate as a low hazard ingredient, although it notes 100% data gaps, indicating a lack of available research regarding this ingredient. No studies were found that noted any negative side effects from the application of Trioctyldodecyl Citrate, although both citric acid and octyldodecanol can be potential irritants, even at low concentrations, so Trioctyldodecyl Citrate may be irritating in some cases. About TRIOCTYLDODECYL CITRATE: Synthetic skin conditioning agent based on citric acid and octyldodecanol, a long chain branched alcohol. Tulsi/Holy Basil: Highly antioxidant, adaptogenic, antifungal, antibacterial, and immune enhancing. Used extensively in Ayurvedic medicine, holy basil is a whole body tonic that helps the body rid itself of environmental, physical, or chemical stress. Restores, balances, normalizes body functions. Currently being researched for its extensive beneficial properties, Tulsi has already been found to be effective for psoriasis, eczema, environmental stress, wound healing, inflammation, and other skin conditions. Tulsi is considered a sacred plant and is found growing in many Hindu homes. Sacred Basil, also known as Holy Basil or Tulsi, is often called "the incomparable one;" it has been considered one of India’s most powerful and sacred plants and is classified as a rasayana, an herb that nourishes perfect health and promotes long life. It is considered a Mother goddess incarnated in plant form, nourishing and sustaining life. It is considered a sattvic plant, meaning 'beneficent to all, harmful to no one', thus carrying an energy of purity and wisdom. As an herb, it boosts immunity and vitality and it can be used as a preventative to maintain a resilient body. Sacred Basil is an adaptogen, harmonizing, balancing and strengthening the physiological axis of the endocrine, immune and nervous systems thus greatly improving resistance to daily stress. Tulasi is cultivated for religious and medicinal purposes, and for its essential oil. It is widely known across the Indian Subcontinent as a medicinal plant and an herbal tea, commonly used in Ayurveda, and has an important role within the Vaishnavite tradition of Hinduism, in which devotees perform worship involving holy basil plants or leaves. The variety of Ocimum tenuiflorum used in Thai cuisine is referred to as Thai holy basil (Thai language: กะเพราkaphrao); it is not to be confused with Thai basil, which is a variety of Ocimum basilicum. Tulasi (Sanskrit:-Surasa) has been used for thousands of years in Ayurveda for its diverse healing properties. It is mentioned in the Charaka Samhita, an ancient Ayurvedic text. Tulsi is considered to be an adaptogen, balancing different processes in the body, and helpful for adapting to stress. Marked by its strong aroma and astringent taste, it is regarded in Ayurveda as a kind of "elixir of life" and believed to promote longevity. 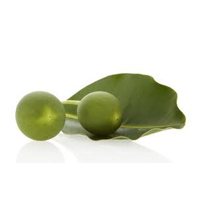 Tulasi extracts are used in ayurvedic remedies for a variety of ailments. Traditionally, tulasi is taken in many forms: as herbal tea, dried powder, fresh leaf or mixed with ghee. Essential oil extracted from Karpoora tulasi is mostly used for medicinal purposes and in herbal cosmetics, and is widely used in skin preparations and for fever, colds and infections. Some of the main chemical constituents of tulsi are: oleanolic acid, ursolic acid, rosmarinic acid, eugenol, carvacrol, linalool, β-caryophyllene (about 8%), β-elemene (c.11.0%), and germacrene D (about 2%). A variety of in vitro studies and animal studies have indicated some potential pharmacological properties of Ocimum tenuiflorum or its extracts. Recent studies suggest tulasi may be a COX-2 inhibitor, like many modern painkillers, due to its high concentration of eugenol. The fixed oil has demonstrated antihyperlipidemic and cardioprotective effects in rats fed a high fat diet. Some laboratory experiments on extracts of Ocimum tenuiflorum have indicated they may have potential in future pharmaceutical applications in the field of cancer treatment, and mitigating the effects of radiation exposure. Isolated O. sanctum extracts have some antibacterial activity against E. coli, S. aureus and P. aeruginosa.